One of the greatest challenges—and honors—I’ve ever had was being asked to write a screenplay about Terry Fox, one of Canada’s greatest heroes. In 1977, at the age of 19, he was a member of Simon Fraser University’s top flight basketball team when he was diagnosed with bone cancer (osteogenic sarcoma) and had his leg amputated. While in the hospital, Terry was deeply moved by the suffering of the young cancer patients around him, and he was angered by the lack of money being put into cancer research. So he decided to run across Canada to raise money for research along with people’s awareness. 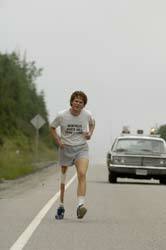 On April 12, 1980, he began his Marathon of Hope in St. Johns, Newfoundland. He ran 3,339 miles in 143 days, averaging 26 miles a day, the equivalent of a marathon each day without a break—on one leg. Terry didn’t make it all the way across Canada, but he captured the world’s imagination—and heart. Terry is one of Canada’s greatest icons and everybody involved was obsessed with getting it right. Through the fifty drafts or so that I wrote over a six month period, I kept thinking about Terry running a marathon a day with a prosthetic leg and running shoes that were primitive by today’s standards, convinced that he could do the impossible. I just kept his words in mind: “Go one mile at a time.” In the end, I think we’ve made a film that Terry would have liked. In coming to this project, what first captured my interest was how young they all were. Terry and Doug were just 21, and neither had done much traveling—or had ever lived on their own before. They were kids on the road together for the first time and pretty unprepared for a simple road trip—not to mention a run across the country. And then these two young guys are joined by a wild 17 year old. It was a recipe for chaos, and amplified the impossibility of the whole venture. I wanted to capture some of that feeling. From the outset, the concept was to create a very intimate portrait of Terry. I spent many hours talking to the people who knew him best, his family, friends, coaches, doctors. Darrell, Judy, Fred, Betty and Rolly Fox regaled me with stories, and Doug Alward was an encyclopedia of information about the experience of the journey. When I first drove out to Port Coquitlam to meet Doug, he immediately took me to the track at Mary Hill Junior Secondary, where he and Terry were challenged by Coach Bob McGill to join the cross-country team. So I stood on the track where Terry first ran, where these two “sparrow chested guys” first became fast friends. That was the beginning of seeing the person inside the hero. My other primary source for the screenplay was Terry himself. Betty Fox gave me copies of his diaries—his logs when he first began training, and his actual diary of the run. As well, Rika, Terry’s girlfriend, let me see the letters Terry and Doug wrote her while on the run. As far as I know, she hadn’t shown them to anyone before and they gave me incredible insight into Terry’s passion and absolute belief in the importance of what he was doing. Terry’s diaries are a sparse and extraordinarily objective account of his physical and psychological ordeal, and there’s never a hint of self-pity—his eyes are always on the prize—the run, raising money, giving hope to other cancer survivors. And Doug’s letters to Rika provided yet another lens to look at Terry. It was a trial for both boys and they definitely had their fights. But they never doubted their friendship and the bond kept them going to the end. Doug’s selfless concern for Terry is the untold story I wanted this film to tell. Another aspect of Terry’s personality I was determined to capture was his humor. Everybody in the Fox family told me about his sense of fun, his practical jokes. When he was focused, no one could bear down like him. But when he wasn’t working, he was very playful person. It was easy to get a sense of this side of Terry, because all the Fox family share it. They are very determined, forthright people and they all have a wicked sense of humor. Terry didn’t just believe he could do the impossible; he believed anyone could. You just had work at it, “one step at a time.” That was the message he gave when he spoke, that was the message he demonstrated for 143 days. It resonates today more than ever because of the obstacles humanity faces in working for its survival. What makes Terry’s belief so important is that it’s not just about hope, which implies something passive, as in “I hope things will get better. No, it’s about work. If you believe in something, and work hard enough, steadily enough, any obstacle can be overcome.